Justin Theroux and Emma Stone's friend and Queer Eye star Jonathan Van Ness says the two actors are friends, amid romance rumors. In recent months, Theroux and Stone, who both star on the upcoming series Maniac, have been photographed together several times, including abroad. The photos were taken months after the actor and Jennifer Aniston announced their separation after more than two years of marriage. "They're friends. We're all friends," Van Ness told E! 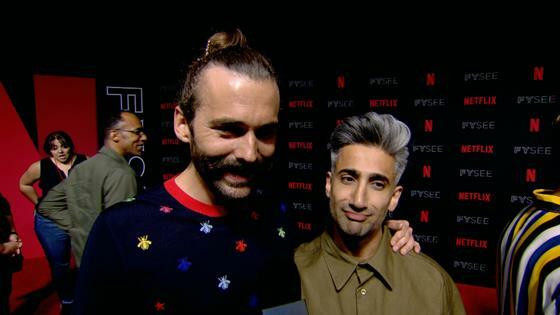 News about Theroux and Stone on Thursday at the NETFLIXFYSEE event for the hit Queer Eye series revival. "Men and women can be friends and it can just be friendly." In April, Theroux posted on Instagram a photo of him posing with Stone and Van Ness, writing, ""Bffffffs. And yes. JUST bfffffs." Stone was last romantically linked to Saturday Night Live writer Dave McCary. They were last photographed together in February, the month Theroux and Aniston announced their separation. Earlier this month, Theroux and Stone were photographed walking together in New York City and were also spotted in a car with Shailene Woodley after the group left Rihanna's 2018 Met Gala after-party. This past Tuesday, Theroux and Stone were photographed hanging out at a resort in the south of France with friends such as Sienna Miller. At the time a source told E! News Theroux and Stone "are just friends." Another source said the actor "is hanging out and having the time of his life. He's casually dating, but it's nothing more."